Liverpool and Chelsea will renew their European rivalry after being drawn together in next month's Champions League quarter-finals. It is the fifth successive year the two sides have met in Europe, with Chelsea triumphing in their semi-final in 2008. Holders Manchester United take on FC Porto and Arsenal play Villarreal, with the winners meeting in the semi-finals. Bayern Munich meet Barcelona in the other tie. The first legs are on 7/8 April, and the return on 14/15 April. The second leg of Chelsea's tie with Liverpool at Stamford Bridge will not be on 15 April after Uefa granted the Merseyside club's request to avoid that date because it is the 20th anniversary of the Hillsborough tragedy. Liverpool's chief executive Rick Parry said he was grateful to Uefa for accepting the request. "It is good news," he told BBC Radio 5 Live. "This was hugely important to every Liverpool fan and to the club so we are very pleased with the outcome. We would have been massively disappointed if the decision had been different." The semi-finals take place on 28/29 April and 5/6 May and the final will be played on Wednesday 27 May at the Stadio Olimpico in Rome. It is the second successive year that four English teams are in the last eight of the competition. Although they were beaten by Chelsea last year, Liverpool reached the 2005 and 2007 finals at the expense of the Blues. As in 2008, the Reds must travel to London for the second leg, but Liverpool manager Rafa Benitez is confident his side can come out on top this time. "Hopefully it won't make a difference to us that the second leg is away," Benitez told his club's website. "We have to think about the first game at Anfield with our fans behind us and look to get a positive result to take to Stamford Bridge." Last season's first leg at Anfield ended in a 1-1 draw after John Arne Riise scored an own goal and Chelsea won the return 3-2 after extra-time. 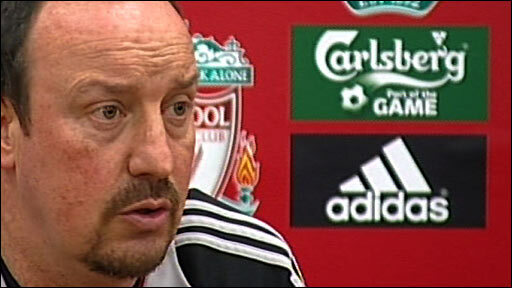 "We need to make sure we don't make a mistake in the first leg like we did in last year's semi-final," added Benitez. "They will be two tough games but we are playing well and clearly we are confident we can win. "Chelsea are a very good team. We know each other very well and this is an exciting draw. "We knew it would be difficult to avoid an English team but we need to approach the two games with confidence. We've done the double over them this season in the league but clearly these two games in the quarter-finals will be different." 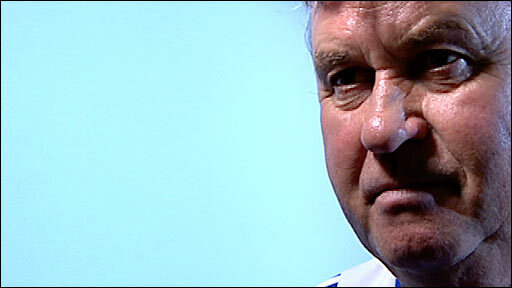 For his part, Chelsea manager Guus Hiddink insisted he has no fears about facing Liverpool. "I was told that there have been a lot of clashes between the two teams in several competitions," said the Dutchman. "They're never boring games between these two big powerhouses of football. "If you have great desire to get to the end in May, you have to play them - Liverpool, Manchester United, Barcelona. I'm OK with the draw." However, Benitez warned Manchester United are favourites for the trophy after they were drawn against FC Porto. "Manchester United must now be favourites, they have an easier draw than us," said the Spaniard. "Our half of the draw is the more difficult now after this draw." The Portuguese club beat Manchester United on their way to winning the tournament in 2004, when then Porto boss Jose Mourinho charged up the Old Trafford touchline in delight after a 90th-minute Costinha goal took them through. And Arsenal's tie with Villarreal is also a reunion of sorts following their 2006 semi-final, which the Gunners won 1-0 on aggregate. "It is maybe a good opportunity to play the first game away from home, but at that level it is very difficult to be creative in your statement," said Gunners boss Arsene Wenger. "It will depend on the quality of your performance and the players available as well. "We have learned that to knock any Spanish team out is very difficult. There are many big clubs in Europe who are not in the quarter-finals. We are one of the five clubs who have for 10 consecutive years qualified for the Champions League, so to go to the end of it is our immense desire." The match also sees Villarreal winger Robert Pires line up against his former club, and the Frenchman said: "Of course it will be a special match. Returning there makes me very happy but today, as a Villarreal player, I want to win to continue in the competition with my team." United beat Chelsea on penalties in last year's final and the draw means another all-English final remains a possibility. Reacting to the match-up with Porto, United boss Sir Alex Ferguson said: "This is a good draw for us. We've met Porto before and obviously we respect any Portuguese team. "We have had a huge Portuguese influence in the club, firstly with Carlos Queiroz but now with Cristiano (Ronaldo) and Nani, so we understand Portuguese football." United will play the second leg in Porto but Ferguson insists that should not be a problem. "You sometimes wonder if being at home first is a good or a bad thing, but I think in this modern-day competition there is no indication of what is better," said the Scot. "The only thing you hope is that you don't lose a goal in the home tie. We are happy with the draw and we are looking forward to the next round." And, referring to the 2004 defeat to Porto, United defender Rio Ferdinand added: "We have a bit of unfinished business with them. "It's a decent draw for us. Emotionally and physically it's perhaps more draining with playing another English side. We know that from playing Chelsea in the final. "It will be an emotionally draining battle for Liverpool and Chelsea and we will have to wait and see how much they kick out of each other!" Bayern Munich's general manager Uli Hoeness was also satisfied with the draw despite being paired with Barca. "This is fantastic news," Hoeness said. "As we've been saying all along, if we're to be drawn against one of the giants, we want the first leg away from home, and that's what we've got. "Barcelona at the Allianz Arena in the return is a dream come true for our fans." The German champions' coach Jurgen Klinsmann added: "Coming face-to-face with the best team in Europe at the moment is a terrific challenge for us all. "It's something truly out of the ordinary. Barcelona will be exceptionally tough, but anything's possible. We believe in ourselves, and there's no need to be overawed." Barcelona's former Arsenal striker Thierry Henry was relieved to avoid the Gunners but is wary of the threat Bayern will pose. "I did not want to play against Arsenal," Henry said. "The English clubs seemed more dangerous but in football anything can happen and Bayern is a big team in Europe. They have many players who can make the difference and score goals. "It is going to be a very difficult match, they scored a lot of goals in the previous round, so it is not going to be easy." Bayern thumped Sporting Lisbon 12-1 on aggregate to reach the quarter-finals. The first legs will be played on 7/8 April with the second legs on 14/15 April. The first legs will be played on 28/29 April with the second legs on 5/6 May.